My father and his Ford Taunus Bravo car in the summer of 1987 in front of ulica Mickiewicza 24 in Poznań where my grandmothers house was. We were in Poland, because my grandmother had died and we had to sell the belongings [furniture and antiques] of my Polish grandparents, because we couldn't take anything out of Poland which was from before 1945. I remember that we smuggled an antique oil painting out of Poland. That was quite a great risk, due to the DRR border guards who were very strict and could have opened our Popup camper in which my dad had hidden the painting. Thank god we were in between Lada's, Polski' fiats, Skoda's and Trabant cars in a long row with little space to unfold the pop up camper. But other cars were deconstructed completely by border police and after that reconstucted again. They took out car seats, car benches and would look into anything very thoroughly We were nervous as teenagers. I do believe my parents were too. I remember that our Ford Taunus Bravo with our Popup camper behind it was a sort of sight seeing circus in the late seventies. People hung out of the window and stood next to our caravan and car watching it, because it was Western-European. We had to unfold the pop up caravan when we had heavy rains in the Polish mountains and everything had to dry. We drove to Poland with this car from Vlissingen in Zeeland to Poznan about 1039 km. I must say, your father has a good eye for an excellent auto. My self was never sure which I liked best, the Opel Manta or the Ford Taunus. Never cared much for the other Opel models as they seemed too stodgy. The DDR borders between West-Germany and East-Germany and between the DDR side and West-Berlin and the DDR-Polish border crossing. 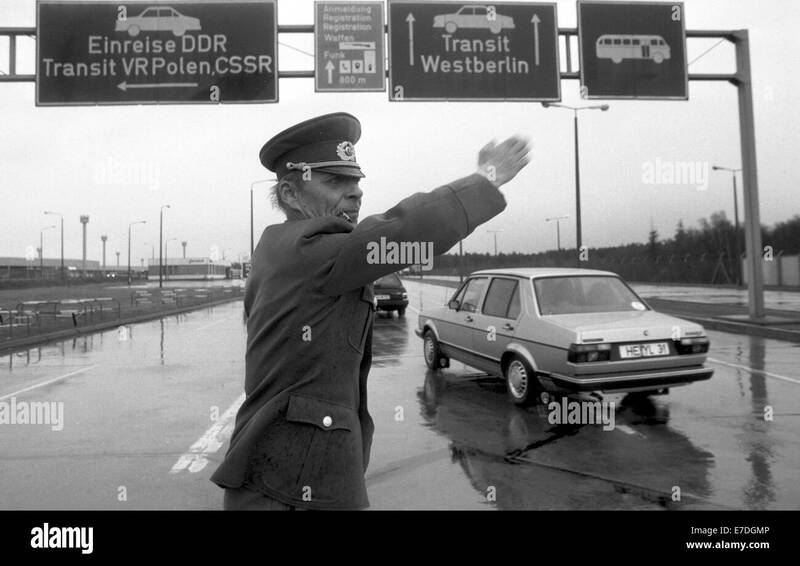 An East German border guard directs arriving vehicles onto the lanes for entrance to the GDR. The Traffic sign 'Einreise DDR, Transit VR Polen, CSSR' was our direction. 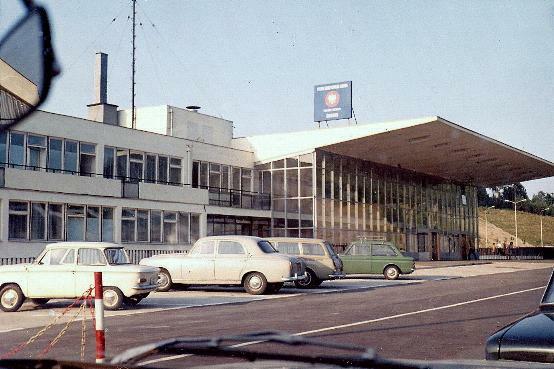 I remember exactly this place. And I remember this kind of border guards. 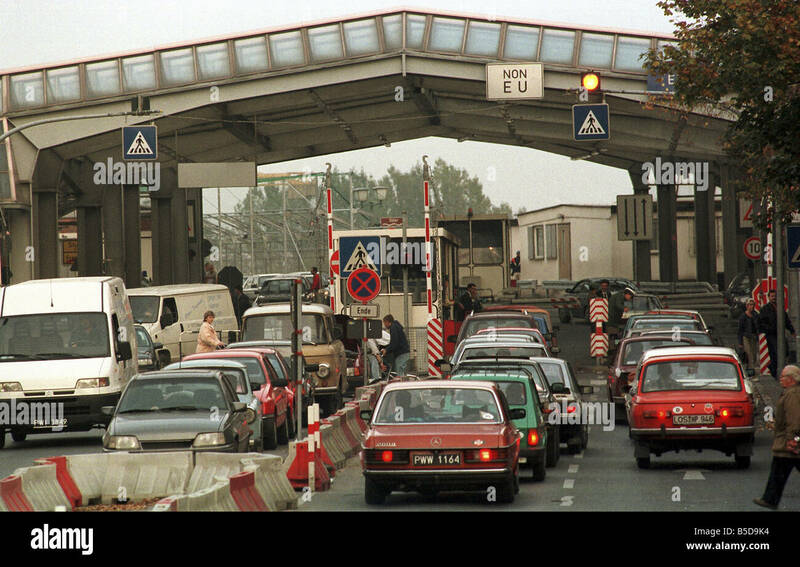 Transit traffic from West Germany waiting to enter West Berlin at the East German checkpoint at Drewitz in 1986. Drivers and passengers would push their cars to save fuel. Like these Westerners with their Renault we often stood next to or against our car, because sometimes it took a long time to get in.